Roomba 770 removes dirt, dust and pet hair on its own. It features Dirt Detect™ Series 2 technology to concentrate cleaning in the dirtiest areas and a Full Bin Indicator that lets you know when the bin needs to be emptied. Using iAdapt™ Responsive Cleaning Technology, Roomba thoroughly vacuums the entire floor, including hard-to-reach spots under furniture. Dual HEPA air filters stop fine dust from circulating in your home. Let the robot do the dirty work. AeroVac™ Series 2 Bin: Employs a powerful vacuum to vigorously pull debris and hair off brushes into the bin. The distributed air collection and clog-resistant design of the AeroVac Series 2 Bin optimizes vacuum effectiveness and dirt and hair packing efficiency. Clean under the bed and other hard-to-reach areas. Roomba provides comprehensive cleaning coverage – vacuuming in tight spots, under and around furniture and along baseboards. Roomba maximizes cleaning by adapting to your unique household environment. iAdapt Technology monitors the cleaning environment more than 60 times per second, using multiple sensors (like cliff detection) and dozens of behaviors (including wall following) to clean your home. Just like you, it spends more time cleaning the dirtiest areas of your floor, making sure you get the cleanest possible results. Roomba knows which areas to clean – and those to avoid. Auto Virtual Wall® barriers emit an infrared beam that Roomba won't cross, keeping the robot in the rooms you want to clean and out of the ones you don't. 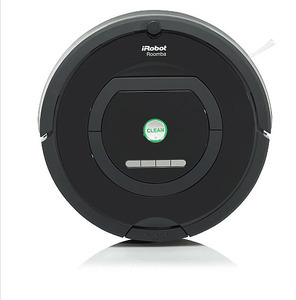 Plus, Roomba charges itself, going back to its Home Base® to dock and recharge between cleanings.